Make the most of your desk space with the Large Keyboard Tray by UPLIFT Desk. The keyboard tray/mouse platform combo features an easy-to-use lift, release, and lock height adjustment mechanism that gives you all the height you need to keep you comfortable at the keys. The wheel tilt adjustment will dial you in to the exact tilt that you desire, and comes with easy-read height and tilt indicators. Its wide, sleek phenolic keyboard platform brings your keyboard even closer to your lap and is easy to stow away under your desk when not in use. The foam pad mousing area and sliding mouse catcher on the same surface can easily switch sides for ambidextrous navigating, whether you work with both hands or shared workstations. The whole tray is easily installed under your current desk with two included tracks; this one simple desk addition will give you much more room to work up top. Looking for a tray with a separate mouse platform? Try the Switch Keyboard Tray by UPLIFT Desk, which features a mousing platform that can be moved from the right side to the left side of the keyboard tray. Which keyboard tray is more popular, the Large or the Switch? While some customers like having a separate platform for a mouse, we find that most customers work just fine on the single surface provided by the Large Keyboard Tray. It really comes down to personal preference. I have limited space underneath my desk, will this still work? The UPLIFT Desk Large Tray comes standard with both an 11" and a 21" track. 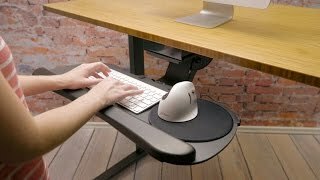 If you only have space to install the 11" track but still want to stow your keyboard tray under your desk, the tray can be rotated a full 360 degrees. Another great option is to add a track spacer. The track spacer allows you to fully stow the keyboard tray under your desk without interfering with the crossbar support running lengthwise under your desk. Here is a great video explaining the track spacer. Can the keyboard tray raise up above my desktop? The Large Keyboard Tray by UPLIFT Desk will raise up to 3" above its track. If you have the track mounted directly under your desktop, it should raise just above the desktop surface. The Track Spacer will drop your keyboard tray about two inches, so it would probably only come to be level with your desk or slightly below. I just installed my keyboard tray and I can't get the tray to lower. Did I do something wrong? If you've just installed your tray and it isn't lowering, you may have forgotten to remove the shipping pin. You can find instructions on how to remove it in step four of your installation guide. You will just need to lift up on the front of the tray and lower the back to relieve pressure from the shipping pin. Then it will be easy to remove. What is the measurement of the platform? The Large Keyboard Tray platform measures 27" wide by 11.5" deep by 0.25" thick. That is plenty of space for a keyboard and mouse. Is the keyboard tray compatible with a desk that has a front lip? As long as you have enough space to mount an 11" or 21" track and the front lip is not so thick as to set your keyboard tray too far back, then you should be okay installing this keyboard tray on your desk. You can call and talk to our Sales Pros about the specifics of your desk to double check that the keyboard tray will work for your setup. How should I care for my keyboard tray? The Large Keyboard Tray can be easily wiped down with a disinfectant wipe. That will keep your keyboard tray clean while keeping the office germs at bay. Add an UPLIFT corner sleeve to solve the issues of limited depth when trying to install a keyboard tray on the right angle of an L-shaped or corner desk. This low profile mount is available in two different models to attach to work surfaces 1'' - 2.5'' thick, and is compatible with all UPLIFT keyboard tray tracks. Really well designed tray! With a bit of creativity I mounted it under an IKEA table top (creativity required not because of the tray mounting system, but because IKEA table tops are not solid wood). It's very sturdy! Easy to adjust. Love that it folds away. I like the included wrist rest, for me it is quite comfortable. I have a Kinesis split keyboard with included rests so it is nice that the tray's built-in rest is removable. There was a shipping error and I got two trays instead of one. I liked the first one so much I decided to go ahead and buy the second one rather than send it back! My Arms and Wrists Finally Have Relief! I installed this keyboard tray last week and I absolutely love it! My back, arms, shoulders, and wrists would hurt every day at the end of work because my keyboard and mouse are on my workstation and my muscles were working all day long. I sit on the computer for 9 hours a day clicking and typing all day. I don't have any tingling pain anymore in my wrists thanks to this keyboard tray, and I love that you can negatively tilt the keyboard tray down to type more comfortably. Very easy to install with the step by step directions included. I recommend that anyone get a keyboard tray if you spend so much time on your computer all day. Since the keyboard tray moves up, down, in, and out, I don't have to worry about the tray beating up my legs all day. This is a great quality keyboard tray and I would recommend it to anyone. I was also able to get a $10 discount on this website with my purchase along with free shipping. Doesn't get any better than that! Pros: Easy to assemble, Easy to Manipulate, Easy to use, the wrist padding is very comfortable, and the keyboard stays at your preference to easily slide under your desk for the next day. Well made -- all the parts are high quality. Relatively easy to install, however I could not turn my desk upside down as it is part of a music studio and very large. The best thing about this tray, and the almost single reason I bought it was because of the short track they provide with it. Almost all other keyboard trays that can be tilted, moved around, etc all come with significantly longer tracks. I was limited to 12 inches exactly. The thing works great -- I use it every day. I only wish one could choose a smaller / less thick wrist rest. Yes, they say you can remove it -- but in fact removal is not that simple. The tilting feature is great - you can tilt the keyboard away from you which allows your wrists to straighten out while typing. Pros: The whole thing is absolutely top quality. Cons: Would like a smaller wrist pad -- or a choice at least. Current wrist pad is rather thick. This is a great keyboard tray. We bought about 12 for employee's who requested them. We remodeled my office with ELFA desk tops and shelving. The desktops extend throughout the office, and I have 2 large computer screens. This keyboard tray allows me maneuverability. It swivels and I can lower it or raise it to a comfortable level for typing. It tucks away under the desktop when not in use. Highly recommend this product! Worth the money! I love the keyboard tray! It really works amazingly well with the dial that lets me set the correct incline and the easy up/down height adjustment feature. I had an easy time installing the track under the desk after watching the installation video on the website. I also called into the human solution to ask a question about the install and they were very helpful as I'm not the handiest person in the world. We are so happy with this tray!! I initally purchased one for one of employees here with wrist issues. It came pretty fast and the installation was very easy for our facilities guy. The employee loved the tray and raved about it so much that we purchased another for an additional employee. Both are very happy with the tray. I tested the tray out my self after installation and was impressed with the adjustability options. Worth the purchase. I am so happy with this tray. For one thing my desk has a metal frame underneath and therefore it's impossible to have a 22 inch long track plate (most trays come with just this long track). I was thrilled to find that the 11 inch track plate was also included in the box which worked out perfectly. The installation was easy and the tray is extremely sturdy. I have a similar set up at work (not the same tray) and now my employer has decided to let me work from home. This tray is far superior than the one I have at work. I now have the flexibility to work from home thanks to this tray and the special size track plate! It was very easy to installed. Great product, I love it. I installed it on a non traditional desk and works great. Better than the one I use at work. It has a dial that is easy to move and control your keyboard tray tilt. The dial even has a degree readout on it so you know the tilt of your keyboard tray. It's very easy to make sure your keyboard is comfortably just above your lap height and is tilted away from you slightly to insure your wrists are perfectly straight. Just like the doctor ordered! $179.00 List Price: $249.00* The list price is the same as the MSRP (Manufacturer's Suggested Retail Price). It may not necessarily be the price at which the product is sold.